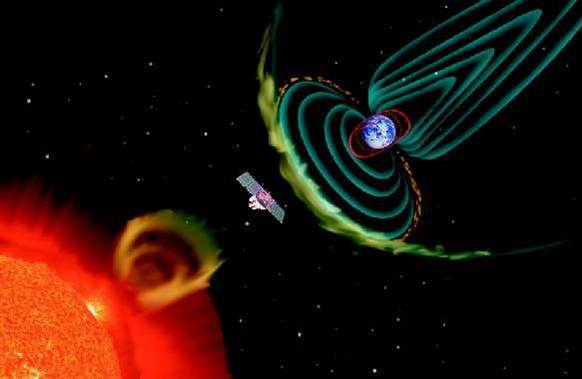 The concept of space weather encompasses all complex influences and effects the sun and other cosmic sources have, from the Earth’s surrounding space to the Earth’s surface. These effects have a deep impact on the reliability of space and ground based technical systems as well as on human life and health. Stormy space weather can lead to amazing polar lights in the ionosphere, but can also affect sensitive satellite avionics and solar cells. In the worst case a satellite may become unserviceable or could even crash. Solar radio bursts and coronal mass ejections may cause perturbations in density, composition, and structure of the ionospheric plasma. The ionosphere is the ionized and electrically conductive part of the upper atmosphere above 60 km (37 miles) in altitude. The maximum of the electron density (≈0.9*106/cm3) exits at an altitude between 200 km and 400 km (125 - 250 miles). The composition of the ions changes with height corresponding to its density or mass. Essentially, electrons and ions are created by solar radiation (Extreme ultraviolet (EUV < 103 nm) and X-ray radiation). The radiation is absorbed and, at the same time, heats the neutral gas. Whereas visible and infrared radiation reaches the Earth surface and defines the weather in the troposphere, the EUV and X-ray radiation are absorbed in the higher parts of the atmospheric layers. In the process of ionization neutral gas atoms or molecules are split into negatively charged electrons and positively charged atoms or molecules (ions). The new gas mixture has electrically conductive properties and is called plasma. This process is based on solar activity and therefor only takes place when it’s daytime. At night, when the solar source has ceased, the plasma density decreases again. The free electrons and ions attract each other and form neutral atoms and molecules again (recombination). By sunrise the process starts anew. The up and down of the ionization is similar to the daily temperature variations on Earth: At sunrise the air heats up; with fading solar radiation it cools down again. In order to ionize atoms and molecules the energy of the radiation must be sufficiently high (at short waves, extreme ultraviolet). By this energy consuming process, dangerous radiation is completely absorbed above 60 km in altitude (about 35 miles). Our atmosphere is also an important protective shield against the dangerous part of the solar radiation, like X-ray radiation. Short-wave X-ray radiation from solar eruptions and charged particles from the solar wind (SWACI Sun) ionize the lower ionosphere at an altitude of 100 km. This additional ionization modifies this layer in a way that affects the propagation of radio waves. During high-energy radio bursts the propagation conditions for VLF-waves change in such a way that one can immediately see the effect in the received signal strength of the SOFIE receiver. Considering its enormous solar radio bursts and mass ejections, the ionosphere is a very dynamic and fluctuating system, similar to the weather on Earth. Radio waves with frequencies below 30 MHz are mostly reflected by the ionosphere whereas radio waves with frequencies above 30 MHz (e.g. VHF, UHF) pass through the ionosphere into space. This effect makes satellite communication possible and signals of satellite based navigation systems can be received on Earth. Due to the ionosphere, radio waves emitted from satellites are slowed down, deviated from their linear propagation and scattered by plasma inhomogeneities. In global navigation satellite systems (GNSS), this relative time delay equals distance errors up to 100 m.
Because of plasma turbulences induced by space weather, signals are scattered. This leads to strong fluctuations in signal strength, the so called radio scintillations. Strong scintillations usually only occur in high and equatorial latitudes. 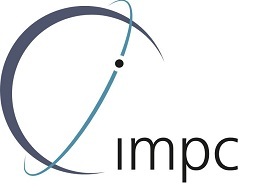 Nevertheless, even in Central Europe ionospheric perturbations can affect the precision and reliability of GNSS applications and reduce its economic efficiency. 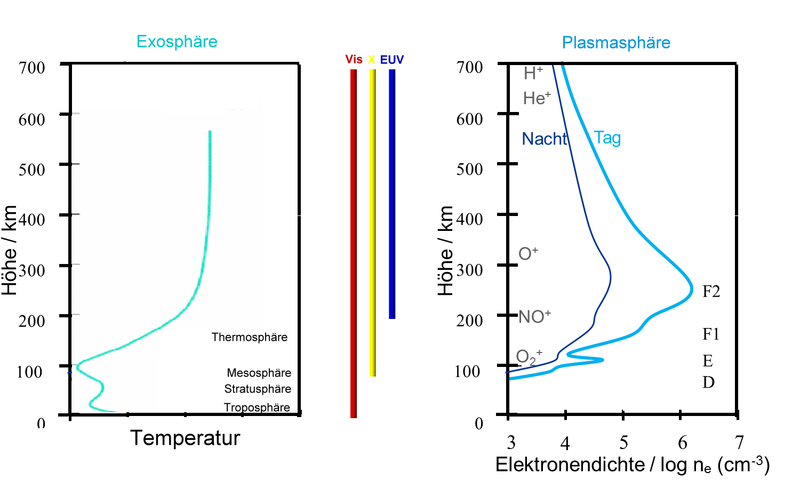 This is an important reason why the examination of the ionosphere is a research field at the DLR Neustrelitz. The constant observation of ionospheric behaviour enables us to provide travel time correction information, e.g. for GPS users (SWACI).